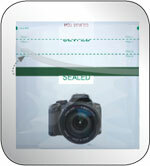 Q: Do you have any tips for maximizing the clarity of the photos taken through the eShield? 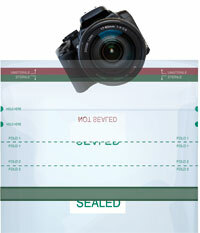 A: Make sure you use an adhesive ring (provided with the Digital Camera version, EC2200) or sterile elastomeric band (provided with the SLR version, EC2400) on the front (bezel) of the lens to tightly hold the wall of the cover across the lens. 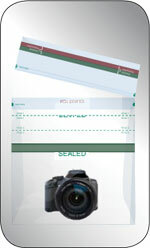 Make sure to eliminate any wrinkles in the wall of the cover from in front of the lens. 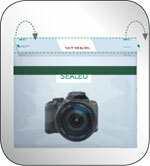 Don’t handle the cover in the area of the lens any more than necessary; handling can introduce wrinkles and scratches on the surface of the bag that can affect image quality. The material used in eShields took several years to develop a good balance between both flexibility, strength, and barrier properties for sterility and optical clarity for photo taking. As with taking photos through any material, there is some loss of sharpness that is dependent on the thickness, surface finish, and material choice. Q: I want to be able to take photos with my cell phone. How can I get the best quality? A: The key to good photos through a sterile cover is making sure the wall of the cover is held tightly across the lens of the camera. Our Digital Camera version of the product (EC2200), comes with a set of adhesive rings designed to hold the cover taut against the lens bezel of the camera. The cell phone version of the product (EC2100) was designed for using apps, not so much for taking pictures, and doesn’t come with the adhesive rings. To get good photos with a cell phone, we recommend using the EC2200 (same size as the EC2100), applying the appropriate sized adhesive ring around the lens of the cell phone camera, and making sure the wall of the cover is held tightly across the lens opening without wrinkles. This will give the best clarity and also prevent the light of the flash from being reflected internally back into the lens and “whiting out” the photo. Q: When I use the flash on my camera or cell phone with the eShield, I sometimes get bright reflections that obscure the subject I am trying to photograph. What gives? A: You may be experiencing “bounce-back” of the flash within the cover, where the flash is internally reflecting into the lens and overpowering the image. The most common cause for this is using the camera without the lens of the camera held tightly against the wall of the cover. 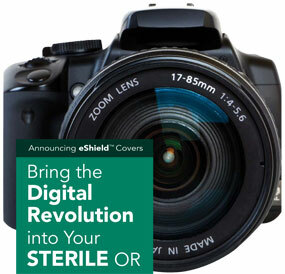 For taking photos, we recommend using either the Digital Camera version of the eShield (EC2200), complete with adhesive rings to hold the cover to the lens bezel (for smaller point-and-shoot style cameras and also mobile phones), or the SLR Camera version (EC2400 for large cameras that don’t have a flat bezel surface around the front of the camera lens) with the included sterile elastomeric ring designed to hold the wall of the cover across the face of the lens. Q: I’m having some difficulty operating the touch screen of my electronic device (cell phone, tablet, etc.) through the wall of the eShield cover. Any tips? A: We designed the eShield to be used in an operating room environment, and it has been tested to work with most touch screen technology, even with double gloves. Motions that include taps are usually not a problem. 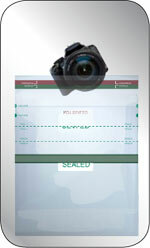 Where you can run into trouble if you’re not careful is on “swiping” motions (such as unlocking a screen, etc.) The issue here is usually not that the touch screen can’t feel the motion, but if there is a wrinkle in the bag across the swipe area, the touch screen interprets the momentary tripling of the thickness of the wall as a lifting of your finger, causing it to think you changed your mind. The best solution is to make sure that you are holding the device in such a way to keep the wall of the cover tight across the touch screen, eliminating any wrinkles in the swiping area. Tip: Some users have suggested using sterile adhesive tape on the back surface of the cover to help keep it tight across the screen on the front. If you try this, make sure that the tape you use is sterile and doesn’t cause damage to the sterile barrier of the wall of the cover.